The vehicles shown here all have rules detailed in Codex Lost Souls, and instructions for conversions. To go directly to the rules or conversion instructions for a specific vehicle, use the links in the entries below. The Harvester is a destroyer, a heavily-armed vehicle capable of mounting swift attacks and decimating armoured targets. For a vehicle of its size it is lightly armoured, but its true worth is in the fear it causes in its enemies. Despite its size and the large number of parts involved, the Harvester took only a day to build and paint. The hull is based on Tony Cottrell's Shadow Ravager, shown in White Dwarf magazine #233, but much of the vehicle is improvised, including the upper turret and wing gun cradles. Gaming with the Harvester has confirmed that its worth is in demoralising the enemy, as it is frequently ignored in the belief that it is too tough to damage. This is not true, but the enemy often fails to work that out until later. 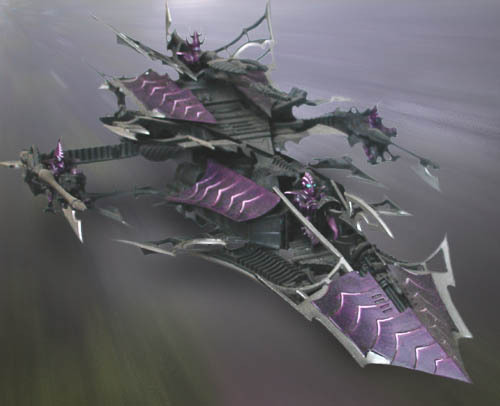 The Marauder is a light gunboat that often accompanies flights of Reaver jetbikes in combat. Its disintegrator provides extra firepower to the jetbikes' attacks. 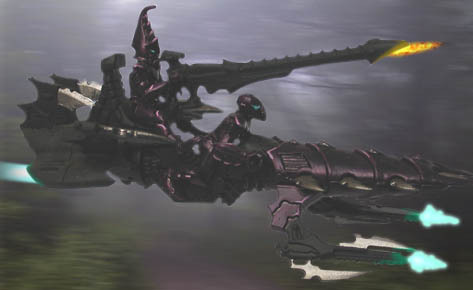 The Marauder is akin to the Eldar Vyper in design, but is intended to be used in the same manner as Space Marine Attack Bikes, accompanying squads of regular bikers. In this role the Marauder benefits from the cover afforded by the Reaver squadron it is attached to, and is able to supplement their often formidable firepower with its own, decimating a target prior to assault. Marauders can be fielded in squadrons of their own, but must be carefully positioned so as not to easily fall victim to shooting.